Over the years I’ve noticed that Disneylanders avoid the park if the weather is extremely bad in either direction. Anaheim has great weather for most of the year, but there are the few weeks when it is either cold and rainy or, like today, very hot. 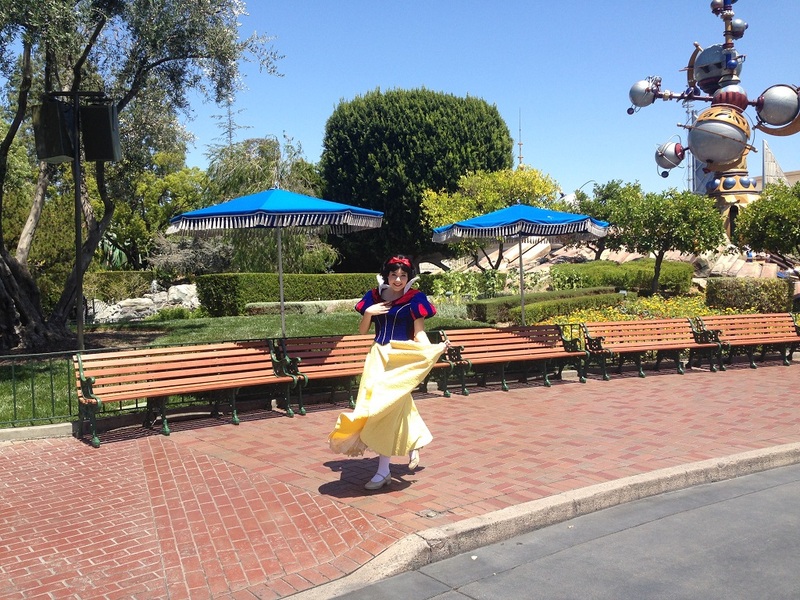 Here I caught Snow White walking through the hub, and no one bothered her. No one bothered her because no one was around. This was the wait time board at 11 AM. 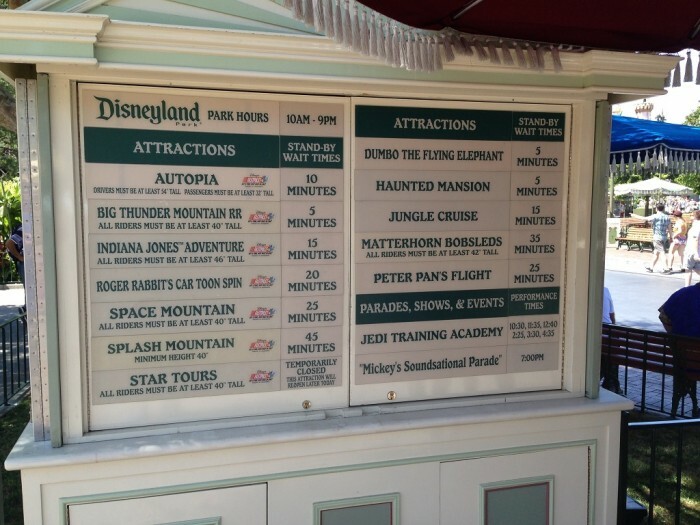 Wait times for the past week or so have been a bit higher than usual because so many attractions are down for refurbishment. Today that factor was hardly even noticeable. 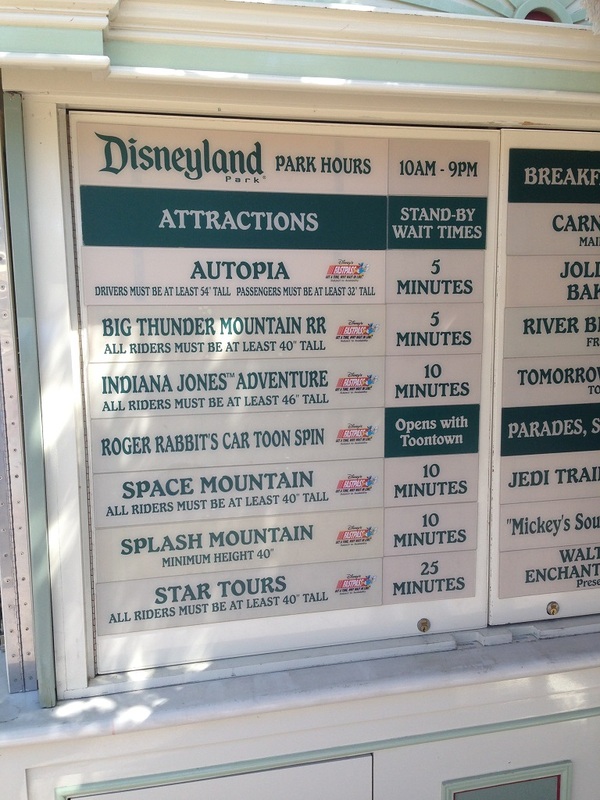 Fast forward to later in the day and wait times were still low when the temperature hit its peak of 103 degrees. 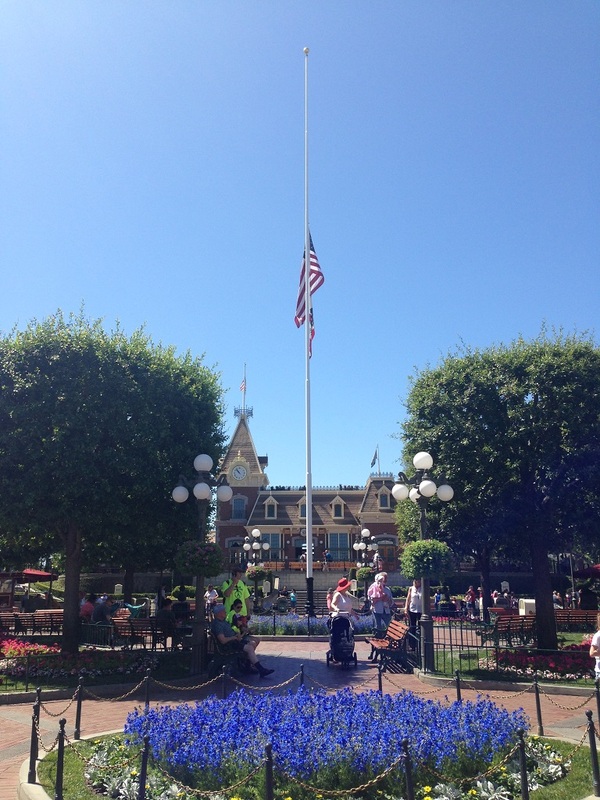 Over in town square on Main Street, U.S.A., the flag was at half staff for Peace Officer Memorial Day. 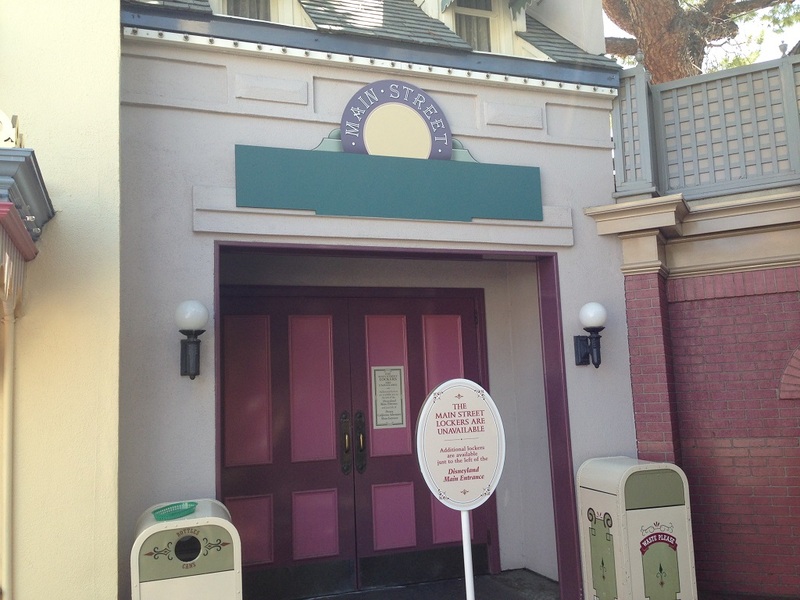 Also on Main Street, the lockers are currently closed for a construction project going on behind the building. Disney is currently constructing a walkway behind the east side of Main Street that will be used during busy times of the day. This should help with the congestion seen during parades and after fireworks. This leaves Disneyland with no lockers for the time being, so if you need one, be sure to grab one outside and to the left of Disneyland main entrance. I stopped by Alice in Wonderland and noticed there is some visible progress being made on the exterior portion of the track. You can see the green original part of the track and the new grey section that will extend the track on each side. 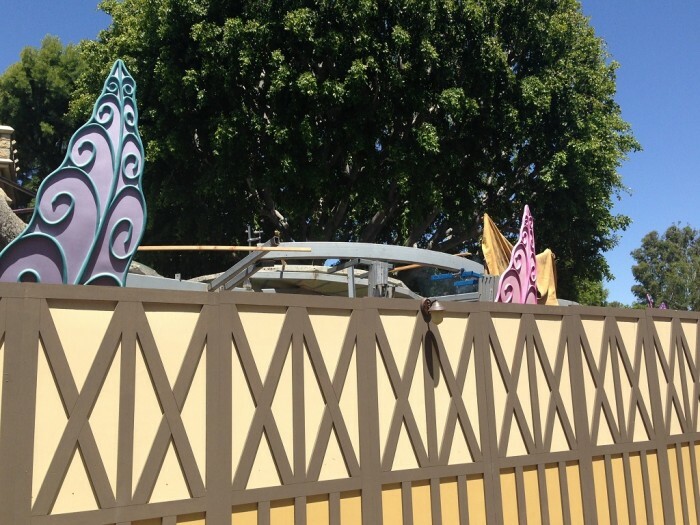 The ride is scheduled to reopen on July 3, 2014. 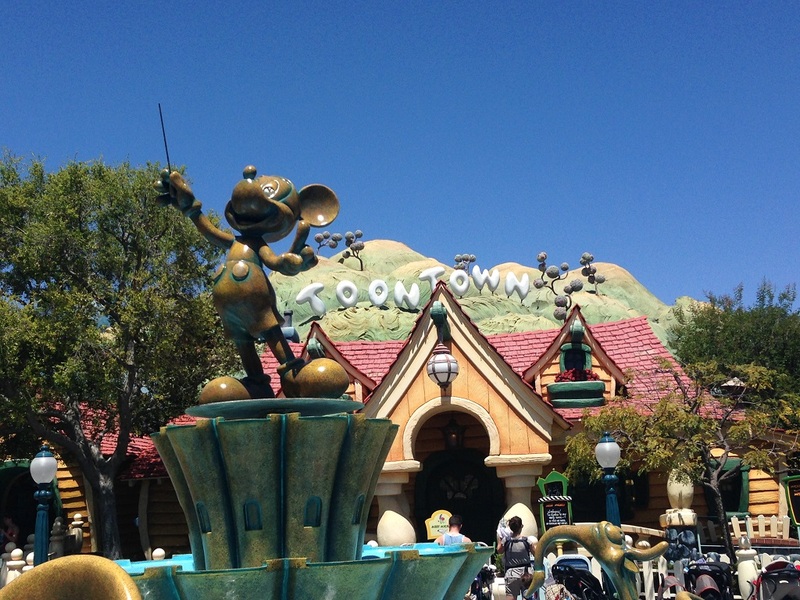 Toontown is wrapping up some refurbishment projects on its two fountains and Gadget’s Go Coaster. 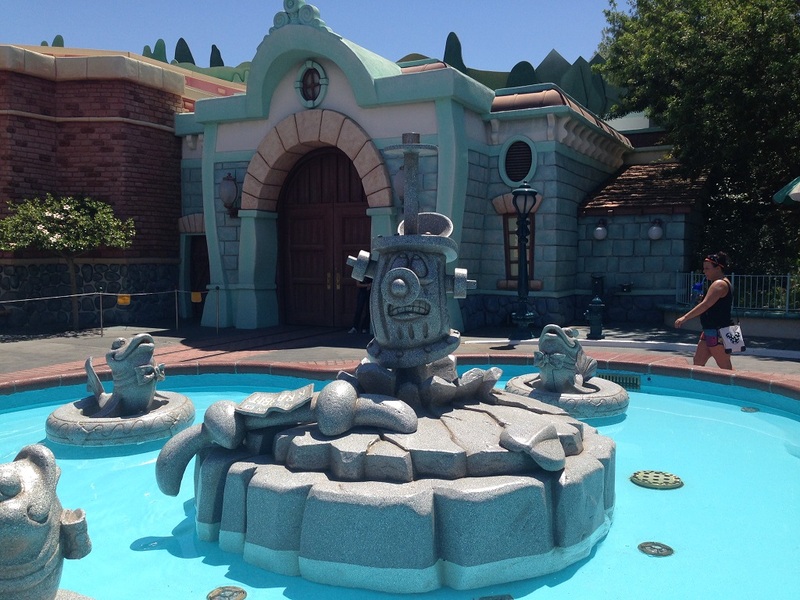 The walls are down at the two fountains; they look great, but for now the Roger Rabbit statue is missing on the fountain in front of Roger Rabbit’s Car Toon Spin. Mickey is still on top of the fountain located in front of his house. He’s all polished up and looking good. That’s it for this week. Be sure to attend our morning breakfast meet if you’re going to be in the parks for the Rock Your Disney Side: 24-Hour event next week. I hope to see you there! We were there on May 15 and May 16 (the hottest days of Spring) and Disneyland was not realy crowded at all! We arrived about 1 PM (we must have just missed Snow White because we would have stopped her)Anyhow- we were greeted by Minnie Mouse near City Hall as we entered Main Street. Later in the day the longest line was Splash Mountain (but of course) and Indiana Jones was a bit of a wiat too, but the attraction itself kept going down. The next day was not as hot (only 98 degrees) but it was Grad Night so that evening the parks got crowded. I suggest that if anyone is planning a trip to avoid Grad Night. The teens were a bit unruly (language and impatient) and were literally running from attractions nearly knocking over little ones. On a good note though, all of the walk up windows at restaurants were happy to give free cups of ice water. The characters tend to have short appearances and take breaks often due to the heat but the “handlers” with them are very friendly and let you know that it will be about 10 minutes and let you know where you can wait for the characters return. Also, at Disney’s California Adventure Park instead of the regularly scheduled “It’s Tough to Be a Bug” at the Bug’s Life Theater, Disney presents a sneak peak of “Maleficent” in 4D…this sneak peak is awesome and did not disappoint!